Battalion histories are a valuable resource for those carrying out research into the First World War. Those compiled straight after the war are excellent accounts in many cases, with the benefit of being written by those who were there and drawing on first-hand accounts. More recent histories have the added benefit of drawing on archival research. John Morse has clearly well utilised the available sources to put together this battalion history. The book covers the formation of the battalion and its training; its movements; its battle honours; and a narrative of its history during the war. After their training the battalion’s first deployment was to Gallipoli. This was a harsh introduction to the realities of war and the casualties began to mount up almost immediately. From Gallipoli they were sent to Egypt, before arriving in France in September 1916 to join the Somme offensive. In 1917 the battalion were in action at Messines and Third Ypres. 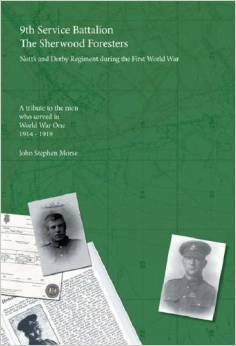 The book does not stop at the end of the war, but also covers the demobilisation of the battalion in 1919. Appendices cover offices known to have served with the battalion and a nominal roll of men, an amazing resource and one that must have taken considerable time and effort to put together. Those who were killed are listed separately, broken down by cemetery and memorial. In addition a list of the gallantry medals awarded to men of the battalion is also provided. Illustrations are plentiful; maps, pictures of the men and newspaper clippings are all used to good effect. Biographies of the men and newspaper obituaries are also included throughout the text. This is a comprehensive history of the battalion and a must-have for anyone researching it or the men who served with it.